Mobile phone users can now follow and track their favorite twitter celebrities on their Android and iPhone sets. Tracking celebrities on twitter just got better. Tweetwood mobile application enables users to access tweets, photos and trends posted by their favorite celebrities in the most user friendly manner. Tweetwood app is developed by Manusis Technologies, the leading web and mobile development company in India. 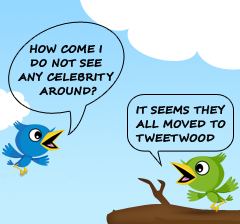 Tweetwood is the largest celebrity portal based on Twitter. With 3000 Twitter celebrities and counting, Tweetwood covers almost every celebrity present on Twitter. Tweetwood recently released sub portals to cover Canadian and UK celebrities on Twitter. The site was already covering US and Indian celebrities on Twitter. The categorization of celebrities based on the country and area of expertise makes it easy to track one’s favorite celebrities on Twitter. Whether a user wants to follow the Stars on Twitter or Footballers on Twitter, Tweetwood is the best tool for that. Twitter has revolutionized the way celebrities communicate with their fans. Tweetwood takes it one step further and presents users with a feature rich website that focuses only on twitter celebrities. It allows users to follow their favorite celebrities without having to follow them individually or worry about the authenticity of their twitter accounts. All Twitter accounts on Tweetwood are verified accounts of celebrities. Along with all the standard functionality users see on Twitter, Tweetwood has a number of unique features that enhances the user experience many folds. Twitter Conversations makes it easy for users to track and share twitter conversations between celebrities. Twitter trends gives users a quick glimpse of what is trending among celebrities. Trends on Tweetwood are different from Twitter trends as they are based on celebrity tweets which are a better measurement of popularity. Manusis Technologies specializes in building scalable, interactive and social web sites and mobile applications. The applications developed by Manusis are cross browser, cross platform and uses the best coding practices and Extreme programming guidelines. Manusis is responsible for building the back-end from scratch for some of the big sites like Gdgt, Designbyhumans, MyCelebrity to name a few. The agile Manu framework and state of the art ManuCMS helps in rolling out big standards compliant sites quickly.